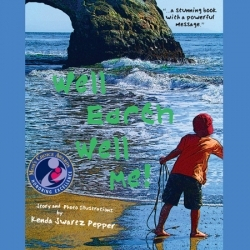 Blending practical advice with eye-catching artwork, Kenda Swartz Pepper’s Well Earth Well Me! inspires children (and even many adults) to take better care of the planet. A song-like poem, with rhyming text and a refrain that is perfect for choral response in large-group and educational settings, asks children to think about the flowers, trees, mountains, streams, sky, and other parts of nature that give the Earth its beauty. It then encourages readers and listeners to think about Earth’s people and how even its youngest and smallest residents can make a big impact by conserving water, planting flowers, keeping litter in its place, and other green efforts. The bottom of each refrain features a related environmental tip. For instance, the part of the poem that mentions books made from recycled paper and even banana leaves is accompanied by a tip on ways to reduce paper consumption and save a forest. Equally engaging as the text are the color- and texture-enhanced photographs (printed on recycled paper, of course!) that depict both kids in action and picturesque nature scenes. The daughter of a forester, a trained children’s art therapist, and a fine arts photographer, author and illustrator Swartz Pepper also writes about the environment and social justice issues for online news sources. She concludes the book with a pledge for a “Well Earth and a Well Me” and includes a blank space for children to make a picture of themselves caring for the planet. Children, their parents, or teachers can upload the artwork to a gallery at the book’s companion website, which has more conservation ideas and information. Whether used in a family setting or as part of a school curriculum, this simple yet effective children’s book will empower readers and listeners to take responsibility for the Earth.